In 2003, I was lucky enough to be part of a small group of astronomers that met at the University of California at Berkeley to brainstorm on an innovative idea: the design of an instrument to image and characterize planets around other stars, called exoplanets, using a telescope in the 8 – 10 meter class. 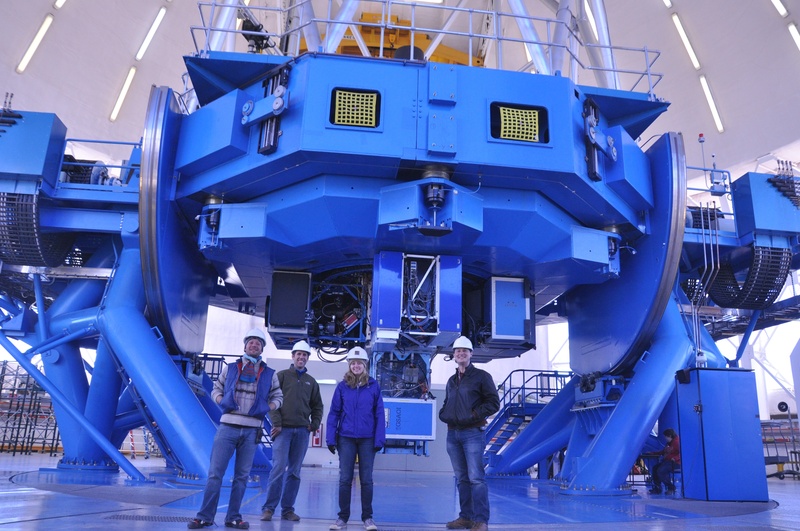 A decade later, such an instrument became reality with the arrival of the Gemini Planet Imager (called also GPI, or “Gee-pie”) instrument at the Gemini South telescope in Chile. 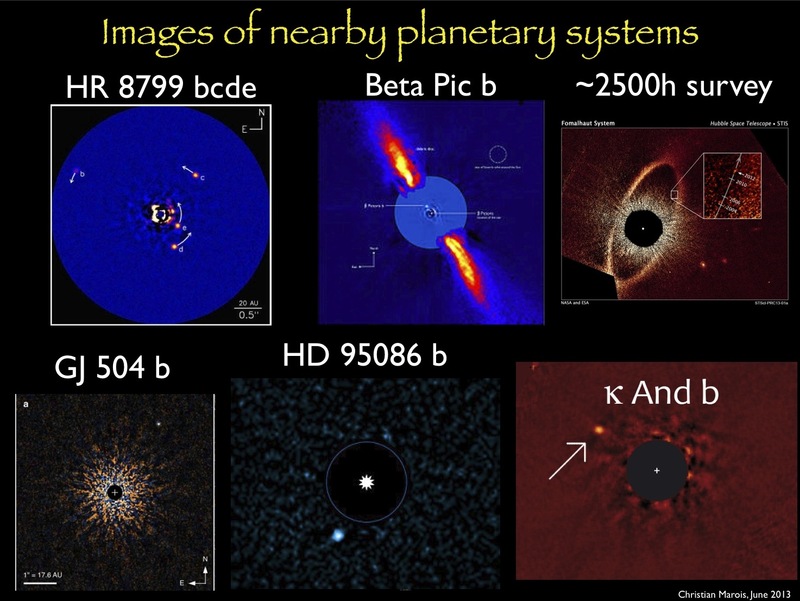 Five known planetary systems imaged with current adaptive optics systems. Fomalhaut shown on the top-right is the only system detected with the Hubble Space Telescope. HR8799 discovery was announced in a Science article in 2008 by a team led by C. Marois including members of the GPI team (credit: C. Marois). Bruce Macintosh, principal investigator of the project, often notes that it was initially difficult to convince the international partners of the Gemini Observatory (operated by the United States, Canada, Chile, Australia, Brazil and Argentina) to invest in an instrument for this specialized project. 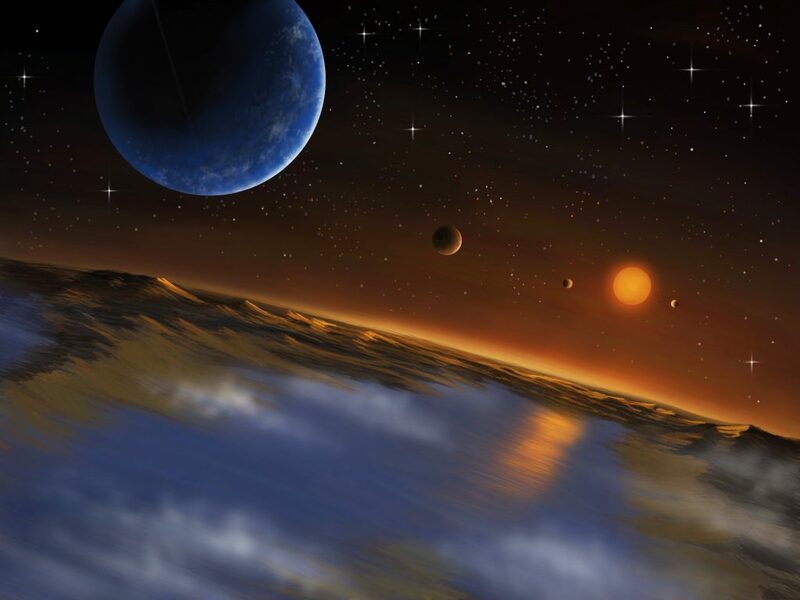 At the time, fewer than 120 exoplanets were known, and the overwhelming majority of them had been indirectly detected through the wobbling of their home star. Our project moved beyond the proven technique of measuring Doppler wobbles to a completely unproven approach – seeing the planet itself. Today, even though the count of exoplanets has risen to a thousand, only a handful have been directly imaged. But those first images, made in 2008, have revolutionized the field and provided a small glimpse through the window that GPI will open up. Producing an image of an exoplanet close to its host star is one of the most challenging tasks in modern astronomy. 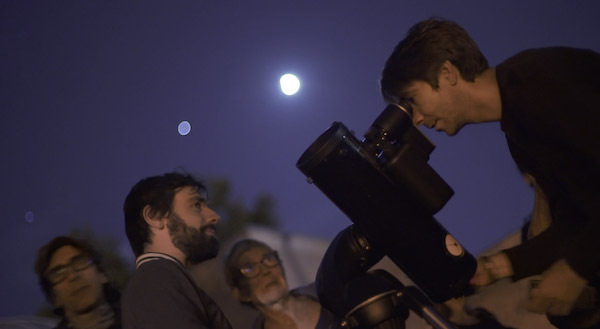 The collaborative efforts of astronomers and engineers are necessary in order to simultaneously solve two problems: 1) How to be sensitive to a very high range of contrast, to detect photons coming from a faint planet located near a bright star, and 2) how to achieve angular resolution sufficient to separate the star and the planet as seen from Earth. The straightforward solution proposed for GPI is to use an adaptive optics system capable of almost perfectly correcting, in real time, the blurring effects of Earth’s atmosphere. The contrast is enhanced by using an active coronagraph perfectly centered on the star to block its light and reduce its glare. To add another layer of complexity to the GPI instrument, we are not only interested in discovering exoplanets, but also in characterizing them. Our detector is not a simple camera, but rather an integral field spectrograph that can spread out the light coming from an exoplanet to measure its temperature and detect the signatures of molecules. The instrument will also be equipped with a polarimeter, a device designed to detect any disks of dust surrounding these stars. What we will find remains unknown, but we’re on the verge of opening a new window into the field of exoplanetary science. What GPI will see: Simulation of the final image produced by GPI. A bright star is observed, but the light is greatly diminished due to the adaptive optics system and coronagraph. A faint point of light (circled) simulates the existence of a planet near the star. When GPI opens its eye at the end of 2013, we should be able to capture photons coming from distant, young Jupiter-like exoplanets around nearby bright stars. How many of them will be discovered is still unknown, but the NASA Kepler spacecraft survey has told us that exoplanets are numerous in our galaxy. In addition, several exoplanets have been seen using current and less effective adaptive optics systems, so we are confident of the success of this instrument. 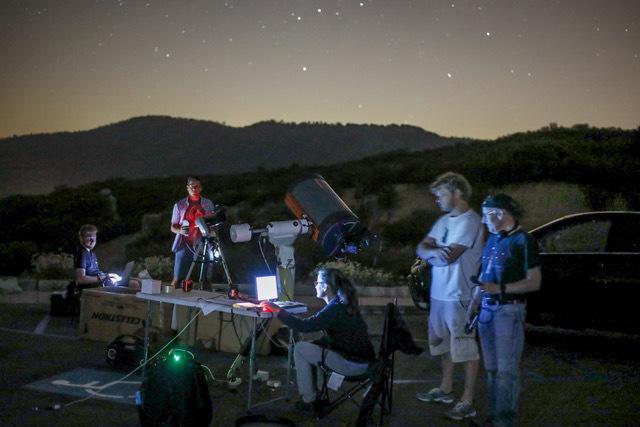 The SETI Institute is hosting part of the science team for the three-year search campaign that will begin in 2014 with the goal of observing 600 young and bright stars in the southern sky. The development of similar projects on other telescopes testifies to the dynamic nature of this new field. An instrument called SPHERE is about to be shipped to the Very Large Telescope, also located in Chile, and the SCExAO system is currently being tested at the Subaru Japanese telescope in Hawaii. We are already thinking about the next step beyond GPI, such as designing a similar instrument for the next generation of Giant Segmented Mirror Telescopes (such as the Thirty Meter Telescope). Another group has been pushing for an even more radical idea – the Colossus Telescope – a 75 m telescope dedicated to the search for waste heat from extraterrestrial civilizations and biosignatures on planets around nearby stars. In two decades, thanks to sophisticated instruments like GPI, stargazers will no longer see stars as simple twinkling specks of light, but also as worlds surrounded by planets. Perhaps we will have collected enough data on these planetary systems to find out if one of them could potentially host life, and eventually be the home of a technological civilization.